Houston, I can't stop snapping. And no I don't mean snapping my fingers (though of course that's fun, too). I mean, snapchatting, because apparently 2012 called, and I have arrived. Truth be told, I have no idea what the hell I'm doing, but it's my newest addiction. So if you want to see some of the bizarre things I post throughout the day in Houston, my username is newishcityHOU! Last week (prior to my life-changing snapchat conversion) I joined some of my friends for dinner at SaltAir Seafood Kitchen, a new(ish) restaurant in Houston's Upper Kirby neighborhood. These friends (Kate, Danielle, Val, Jill, and Frances) are a group of incredible women I met through yoga, and we had quite the lovely evening together! AND I am happy to report that the restaurant and food were just as stellar. First off, the restaurant has cocktail onions. If you know me at all, you know one of my life's quests is to locate restaurants/bars in Houston that have these garnishes. 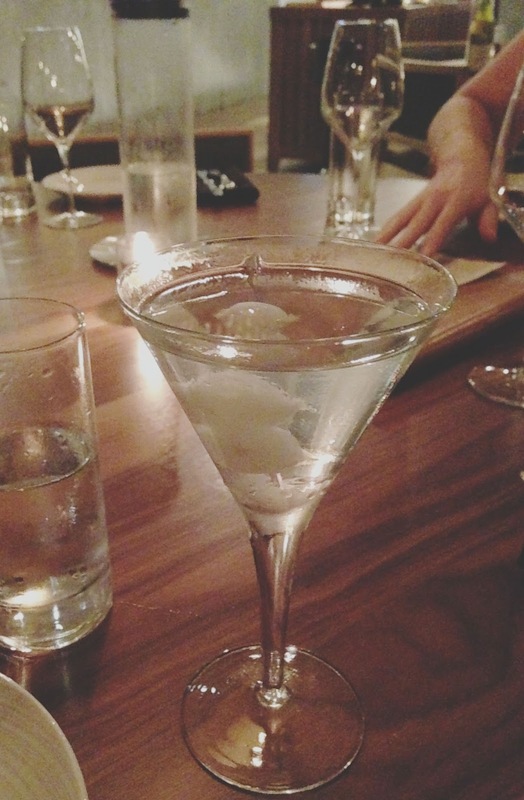 I was able to enjoy a stiff and sensational pre-dinner vodka martini with onions! 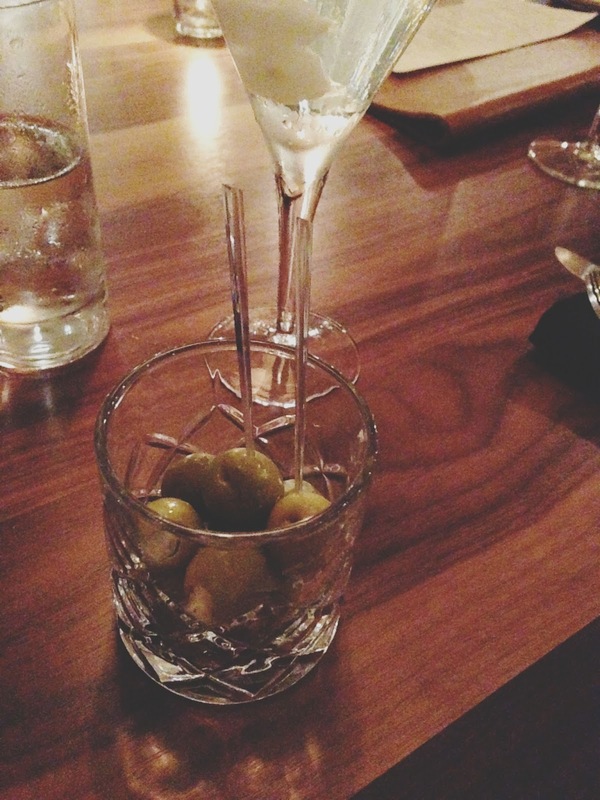 When ordering her martini, Kate asked if they had blue cheese-stuffed olives. Our super friendly and engaging server informed her that yes they did, and they were freshly stuffed at the restaurant every morning. Danielle and I became irrationally (okay, rationally.) excited about this, and he offered to bring us some of these awesome, salty, blue cheese-stuffed olives to nibble on. Our server explained that the food on the menu is primarily meant to be shared. So share we did! To start, we ordered the scallop ceviche with shrimp chips<~~(most fun thing to say ever? 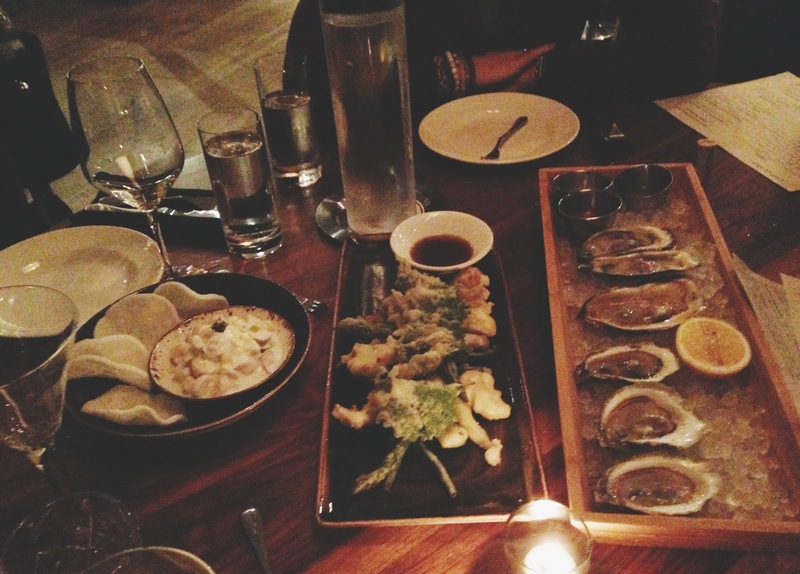 ), the vegetable tempura, and 1/2 a dozen oysters. Since I'm a vegetarian, and since ingesting mollusks might literally actually kill me<~~(most dramatic person ever? ), I only tried the tempura during this round. Lightly battered and fried haricot verts, zucchini, asparagus, cauliflower, eggplant, and sea beans were served with a side of sweet and salty ponzu. The dish was light, pleasant, and bursting with flavor from the wide variety of vegetables included within. Loved it! 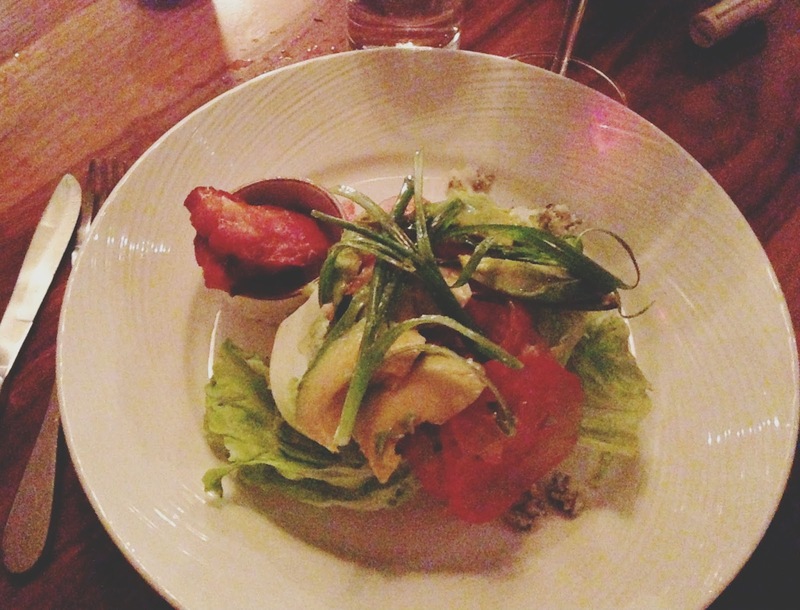 We then ordered the restaurant's iceburg salad, and asked for the SLAB of bacon (seriously, look at it!) to come on the side. I am definitely into iceburg salads, and I was definitely into this one. A huge hunk of iceburg lettuce was topped with robust blue cheese, crisp green onions, fresh avocado, and a light, yet creamy, green goddess dressing. The pleasantly tart dressing really stepped this salad's game up a notch, and it received high marks from all of us! 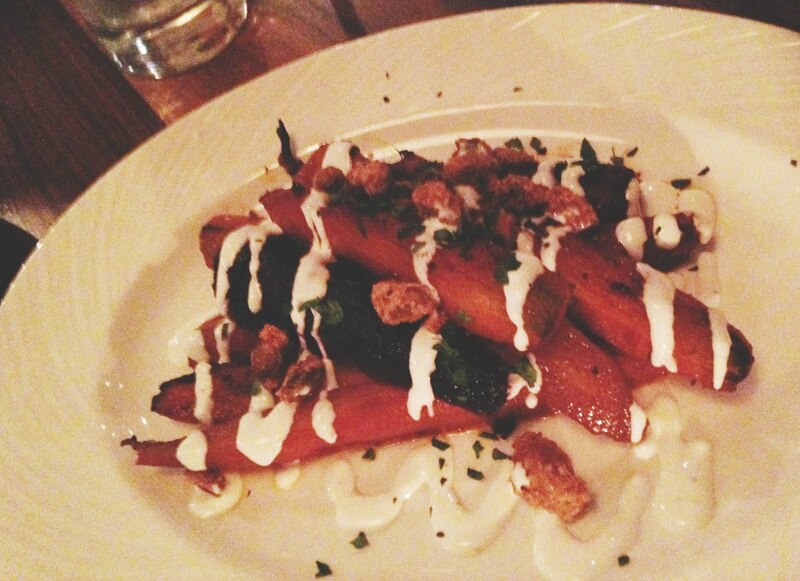 Our server gave a glowing review of the carrots, so we took his word for it and ordered them. I'm not generally a major fan of cooked carrots, but I'm telling you, if cooked carrots always tasted like this, I certainly would be! The sweet, buttery (though I'm not even sure if butter was present), roasted carrots were topped with harissa, yogurt, and pistachios, which I believe were candied. Sweet, silky, smooth, and full of delightful textures, this was my favorite dish from the restaurant! The next round of food included several items from the vegetable portion of the menu, including radishes, zucchini, and potatoes. My second favorite dish of the evening - the radishes - were absolutely lovely. Thinly sliced, crisp, raw radishes were included in the dish, which added a nice amount of texture, but the roasted radishes were what made this dish so incredible. 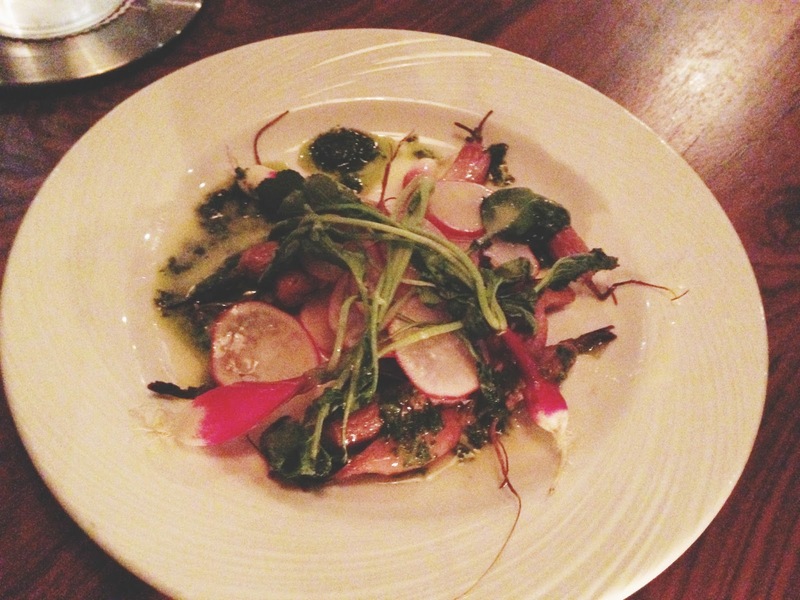 Roasted in butter and sea salt, and topped with a radish top pesto, this unique dish was earthy, yet delicate. The flavor of the cooked radishes themselves was softened from the roasting process, and the pesto was a wonderful, flavorful addition to the dish. Although not quite as innovative as the previous food items, the zucchini was also great. 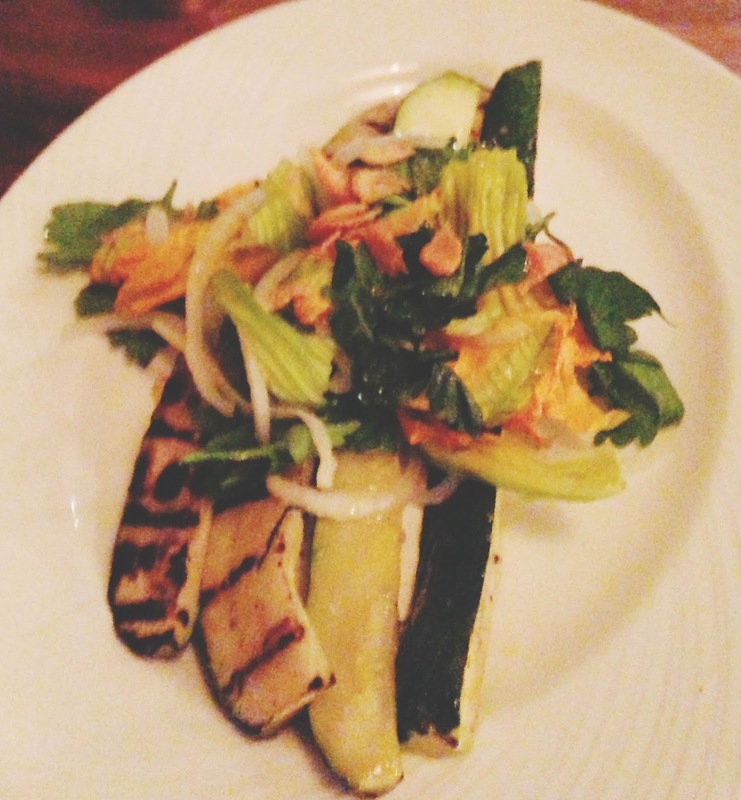 Charred and grilled, tender zucchini was topped with a crunchy, herby, squash blossom gremolata. This dish was also very well received by the group. 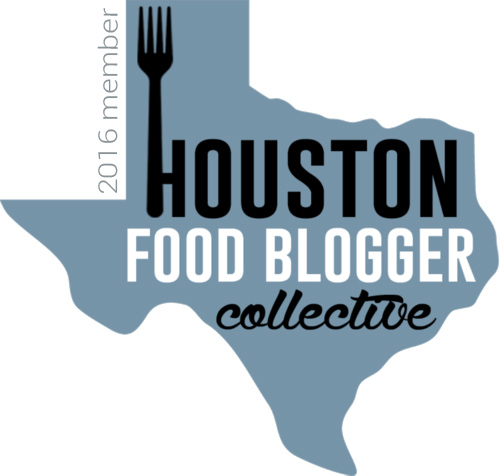 Come to think of it, every dish was well-received by our group of Houston food lovers! 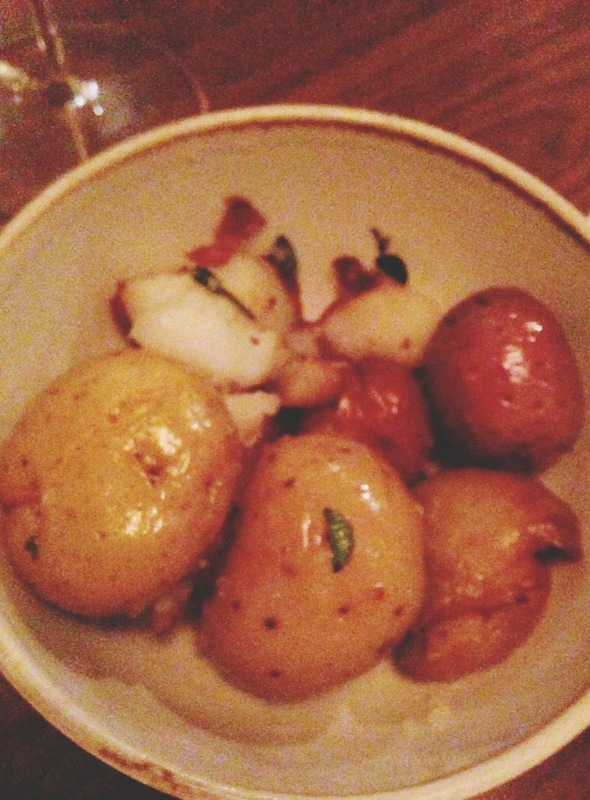 Like the potatoes: Small, whole, soft potatoes were doused in lemon and various herbs. They were plump, hearty, and thoroughly enjoyable! Other various non-vegetarian items were ordered, and seriously, we all loved everything we ate. So of course we had to order a dessert four desserts. The restaurants' desserts that graced us with their presence were the lemon ice (angel food cake, white chocolate cream, lemon thyme meringue shards, lemon sorbet, limoncello snow), the milk chocolate mousse (mousse, chantilly, chocolate curls), the butterschotch pot de creme (butterscotch custard, chantilly, dulce de leche), and the peanut butter jelly. All four were great and completely different from one another, but my personal favorite was the peanut butter jelly. On the plate was a slice of "cake" consisting of a peanut butter chocolate brownie (ugh, amazing) and vanilla cheesecake. 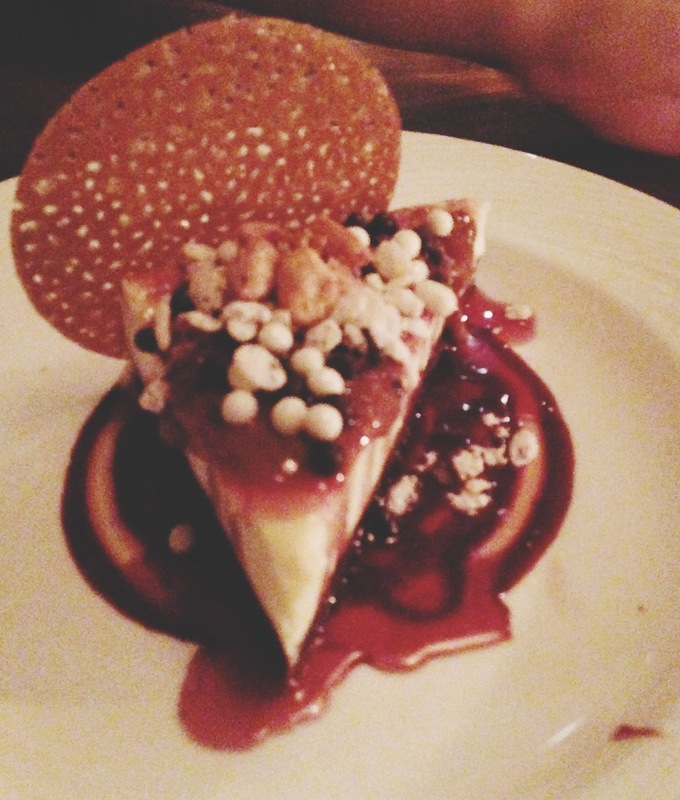 It was drizzled with dulce de leche, a grape gel, and toasted peanut "crunch". The cake was creamy and had a wonderful contrast of flavor between the rich peanut butter chocolate brownie and the lightly sweet vanilla cheesecake. The grape gel provided a fun punch of fruitiness. What I found to be the real joy of this dish though, was the toasted rice and peanut crunch, which were these teeny, airy, peanut buttery, crunchy balls sprinkled on top. They added a delightful pop of flavor and texture! If you're looking for a fancy night out at a Houston restaurant that serves beautifully crafted and unique food, look no further than SaltAir Seafood Kitchen. 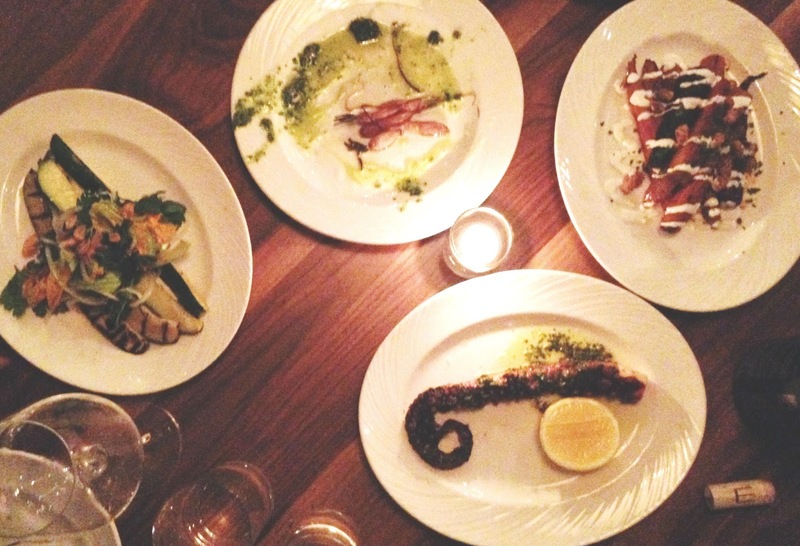 The elegant interior is open, airy, and dimly lit, and the service is friendly, knowledgeable, and inviting. Even as a vegetarian, I still had plenty of food options, all of which were sensational. 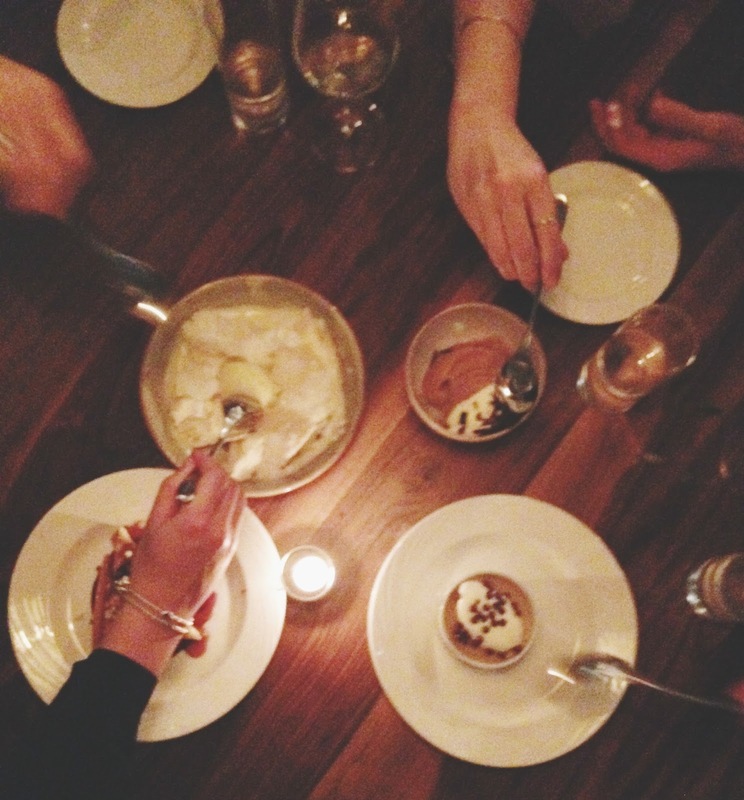 While it's certainly not an inexpensive night out, it is sure to be a memorable one. 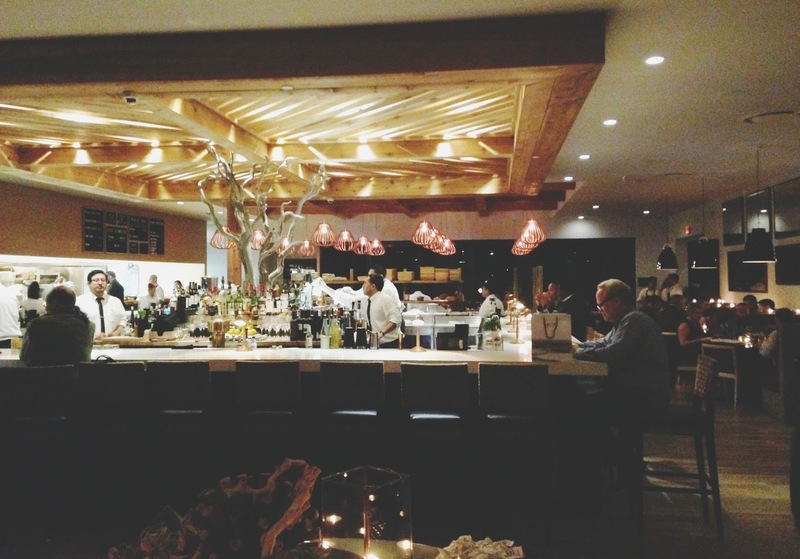 SaltAir Seafood Kitchen is a wonderful addition to the Houston restaurant scene!